Not to be confused with Tathamet. Tathamet was the second being to exist in Creation. The counterpart of Anu, its creation and death led to the birth of the Burning Hells. According to various myths, Anu was the first, and for a time, only, being in Creation. Seeking a state of total purity, Anu cast all evil from itself. 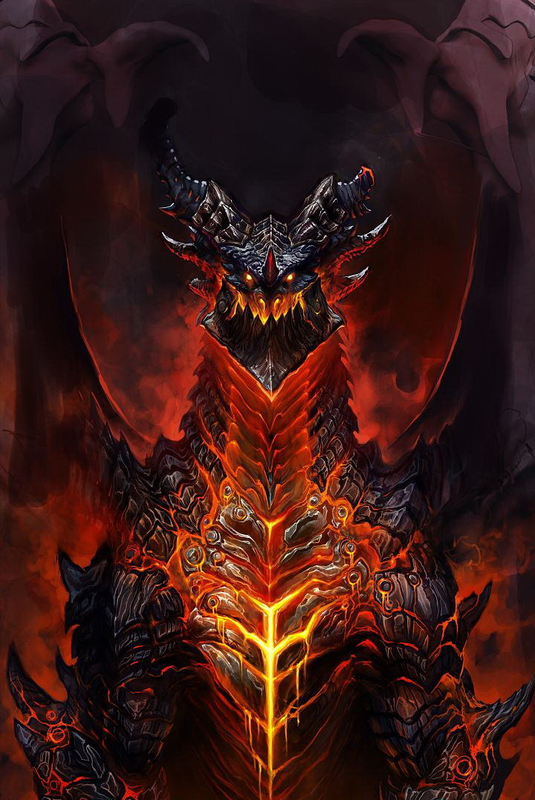 However, these elements could not exist in a state of separation, and coalesced to form a new being: Tathamet, a seven-headed dragon that was the sum total of all Evil. Though separate entities, Anu and Tathamet were bound within the Pearl that contained them. There they warred against each other in an unending battle for ages uncounted. Tathamet, along with Anu, died in the final battle they had against each other. Tathamet's blackened, smoldering husk spiraled into the lower darkness of reality. From his putrid flesh arose the realms of the Burning Hells, and the race of Demons that arose from them like maggots from a corpse. Additionally his seven heads spawned the Great Evils. The strongest of his maws gave birth to the three Prime Evils, while the four lesser heads gave birth to the Lesser Evils. Uncounted ages later, Tathamet, in some sense, returned to the face of Creation. Diablo, the Lord of Terror, was able to combine the essences of the other six Evils into his own body, becoming a singular Prime Evil. While he was defeated by The Nephalem in Heaven and his spirit returned to the Black Soulstone, Diablo remained a singular Prime Evil and, through the destruction of the stone at the hands of Malthael, was released into Creation once more. Tathamet is possibly named after Tiamat, a chaos monster and the primordial, draconic goddess of the oceans from Babylonian mythology. Tiamat mated with Abzu, the god of fresh water, giving birth to the gods; this parallels the clash of Anu and Tathamet creating the universe. Tiamat is later killed by Marduk, and her divided body form the heavens and the earth, like how Tathamet's body became the foundation of the Burning Hells. In Dungeons and Dragons, Tiamat is often portrayed as a five-headed dragon. Tathamet's depiction and namesakes are possibly influenced by the Beast and the Serpent, two beasts who bring about Armageddon in the New Testament. There are other myths in mythology throughout the Middle East depicting a seven-headed dragon or serpent as an evil being of destruction. The relationship between Anu and Tathamet may be based on Ahura Mazda and Angra Mainyu of Zorastrianism. Ahura Mazda, the counterpart of Anu, was the original "uncreated" god who created Angra Mainyu, the counterpart to Tathamet, by purging himself of all his evil. Just as Tathamet is a being of destruction and the "father/grandfather" of all demons, Angra Mainyu is a being of chaos and destruction who created demons to battle Ahura Mazda.